Outrageous child support obligations are bad for everyone. The person who is obligated to provide child support may find they are unable to support themselves and their children. The person receiving child support payments may discover that the obligor, finding they are unable to make full support payments, quits making payments all together. In either event, the children suffer. At LoDolce Family Law, Attorney Ann LoDolce has over 34 years experience negotiating fair child support payments. In those cases where we cannot obtain a fair agreement, we are prepared to assist you in arriving at a fair support arrangement through mediation. 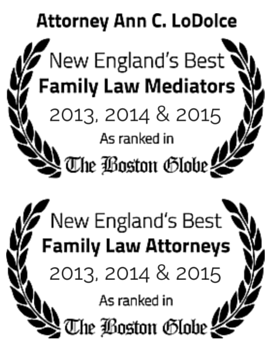 Child support is calculated using the Massachusetts Child Support Guidelines. We can explain the guidelines to you and analyze if there is any reasons a court may deviate from the guidelines. In addition, we can assist you in mediation to arrive at a modification of child support payments due to a significant change in circumstances.